Sky | Tutima Glashütte/Sa. Sky - Tutima Glashütte/Sa. A decade full of new beginnings inspired Tutima to create the new Sky line, which brings the lifestyle of the Seventies to the contemporary wrists. The de-sign of these automatic watches interprets the spirit of the vivacious 1970s in a modern way. 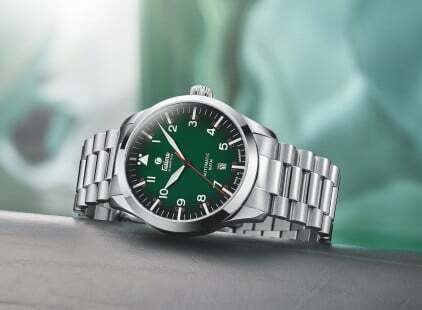 Blue, green or red dials assure that the Sky is an exceptional eye-catcher. 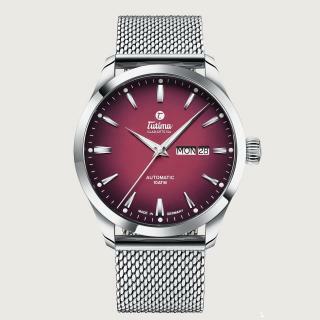 Sky’s attention-getting styl-ing is further enhanced by its dial’s dark dégradé colour gradient, its polished stainless steel case and its fine Milanese bracelet. These newcomers offer an affordable entry into the world of Tutima. In contrast to the striking colour scheme on the di-als, the rest of the design is puristically reduced to highlight the functionality that Tutima has always prioritized. The 41-millimeter case with screwed crown can withstand up to ten atmospheres of water pressure. A domed and antireflective sapphire crystal above the dial assures that the day of the week, the date and the time are perfectly legible. The time display can also be read in the dark thanks to Super-LumiNova on the hands and the luminous hour dots. A sapphire crystal in the back of the case reveals the reliable timekeeper that powers the brand’s three-handed watches: Tutima Caliber 330, which also sets the pace in the new series of Flieger watch-es. The rotor is adorned with Tutima’s characteristic 18-karat gold seal. The fully wound movement amasses a 38-hour power reserve. The new Sky models expand the Tutima collection of entry-level wristwatches with a series that com-bines elements from yesterday and the watchmaking skills of today.